Select the category of Free Weight Equipment that fits your needs. We offer a complete line of Free Weight Equipment designed to target every part of your body. 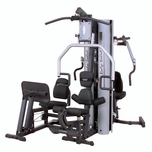 At Fitness Giant we only sell the best quality exercise equipment available online. We sell the most complete line of exercise equipment and free weight equipment for your home and also offer a huge selection of hotel fitness equipment as well as Crossfit equipment and accessories. Our commercial line of equipment is ideal for hotel exercise rooms and corporate fitness centers. We are here to answer your emails and phone calls should you need any help in selecting the piece of exercise equipment that's right for you. Our free weight equipment includes exercise equipment such as Dumbbells, Home Gyms, Olympic Weight Sets and Leg Presses. and many other types of free weight equipment. Strength Training:Equally important as cardiovascular training, strength workout regimens build muscle, improve flexibility, prevent injury and raise metabolism to name a few. Like anything else it's important to have the right tools to get the job done correctly. The proper piece of exercise equipment or free weight equipment in your home gym will assist you in achieving your goals. We carry fitness equipment from names like Bodycraft, Body Solid, Yukon Fitness, Stamina Products and more. Ab & Back Machines:Developing core strength is vital to a complete exercise program. Strengthening abdominal and back muscles together provide for more overall body strength and better posture. There are many pieces of free weight equipment which cater to building strong ab and back muscles. Lat machines, VKR's (vertical knee raise), sit up benches, training balls etc. offer the home gym enthusiast plenty of training options. There are also plenty of charts that provide a visual aide for performing abdominal exercises. Benches: There are many types of weight benches and many different uses for them. Olympic weight benches dumbbell benches, preacher curl benches and ab benches are worth discussing. 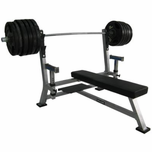 Olympic weight benches are generally 48" wide and require the use of a 7' standard or Olympic bar. Anything shorter will not sit properly on the bar holders. The Olympic weight bench is the most popular size and is what's found in most gyms. Coupled with an Olympic weight set, it provides the means to get a great overall body workout. 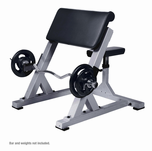 Dumbbell benches are generally weight benches without any type of bar holders built into them. They are sometimes simply flat benches or adjustable benches that will decline and incline to vary your workout. Options such as preacher curl attachments and leg extension / leg curl attachments increase the functionality of these weight benches. Preacher curl benches are primarily designed to work your biceps. They are usually used in conjunction with an Olympic or standard curl bar. Since they stabilize the arms during the exercise, they help isolate the muscles being used. If you have the space in your home gym, this is a great piece of fitness equipment to add to your collection. Ab benches are a staple in any home gym. They're an essential tool to creating strong abs while keeping the back more supported. DumbbellsDumbbells are now available in a variety of new styles and finishes. The most popular still remains the hex dumbbell Also available are rubber coated dumbbells chrome dumbbells, vinyl dumbbells, and neoprene varieties. A simple set of dumbbells along with a bench can offer a compact inexpensive means to start your home gym. Some accessories that will round out the gym are charts and or books that show how to perform the exercises correctly. Also a dumbbell rack to organize your dumbbells is a must. Some new styles of adjustable dumbbells on the market have also become very popular. Power Blocks are very innovative in their design by offering a full set of dumbbells in a space saving easy to use format. We carry dumbbells and weight plates from Troy Barbell, Power Block, York Barbell Body Solid and XMark Fitness. Dumbbell Racks & Plate Trees: No home gym should be without a place to store your dumbbells or free weight plates. Dumbbell racks come in many sizes and styles to organize your dumbbells and make them much more accessible. Weight plate trees normally are sold in Olympic or standard sizes based on the types of weight plates you are trying to store. Home Gyms:One of the most popular pieces of fitness equipment today is the home gym.Home gyms give you the ability to perform dozens of exercises utilizing a single piece of exercise equipment. Today's models are compact, sturdy and extremely smooth in their operation. With weight stacks built into the gyms there are no weight plates to carry around or load onto bars. This translates into a very safe workout environment. Most home gyms offer exercises for your legs, chest, back, arms, shoulders and abs. Most come standard with a 200lb weight stack and the option for more weight if you are so inclined. Options such as leg presses, dual weight stacks and VKR's (vertical knee raise) are available on many models. Placing a exercise mat underneath the gym is a great way to protect the surface from sweat and the weight of the unit. A home gym handbook will guide you through the various exercises your equipment can perform. Check out our selection of home gyms from Bodycraft, Body Solid, Stamina Products and Yukon Fitness. Leg Machines:The importance of a strong lower body cannot be emphasized enough. The three most well known muscle groups exercised are the hamstrings, quadriceps and calf muscles. There are several options for your home gym that will help you build strong legs. The most popular is the leg press. Leg presses are available in two main varieties: vertical leg press and leg press, sometimes called a hip sled. The vertical leg presses are generally less expensive, more compact and put your body in a supine position. The standard leg press usually offers two exercises. The seated leg press and standing hack squat. On some models you can also perform calf raises as well. Though more expensive and larger than their counterparts, the leg press/hip sled is the most popular leg press found in most home gyms. Other leg machines to compliment your home gym include seated calf machines and leg extension / leg curl developers. Seated calf machines do a great job of isolating the calf muscles due to the seated positioning of the equipment. Leg extension / leg curl machines target the two main muscle groups in the legs and are a great inexpensive way to develop your muscles. 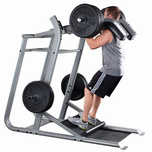 Both the seated calf machine and leg developer use standard or Olympic plates (which are sold separately) for resistance. Pilates:is fast becoming a popular alternative and or addition to the workout regimen of many. Pilates builds strength and flexibility using anything from Pilates rings or stretch bands on up to Pilates machines Fitness Giant offers a wide variety of machines, tapes, and accessories to help you get started on your program. 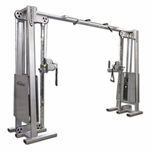 Smith Machines: Smith machines offer a great deal of safety and variety when performing certain exercises.Smith machines have an attached Olympic bar which allows the user to perform squats, benching and other exercises in complete safety and without the worry of getting "stuck" during an exercise. It's a great piece of fitness equipment to add to your home gym especially if you find yourself weightlifting on your own. 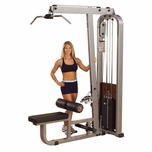 We stock smith machines from manufacturers such as Bodycraft, Yukon Fitness and Body Solid. 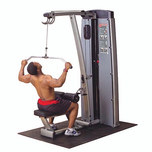 Many of our smith machines can be purchased with attachments such as lat pulldowns, pec decs and leg developers. Smith machines usually use either linear bushings or linear bearings to create the smooth movement of the Olympic bar. Linear bearings are superior to the bushings but cost quite a bit more. 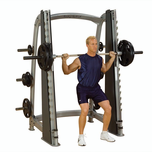 Squat & Power Racks: While they don't offer all of the features of a smith machine, the power racks and squat racks also offer a safer workout environment for serious weightlifting. Built-in safety bars act as a spotter during benching and squat exercises. Most power racks also have a place to do chin ups and dips. Attachments available on some models include a pec dec and lat machine. Coupling your power rack with an olympic weight set and adjustable bench completes the home gym. Check out our power racks from Body Solid, Bodycraft and Yukon Fitness. 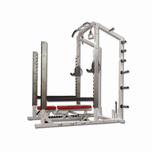 Weight Sets: Weight sets are available in standard and Olympic sizes. Olympic weight sets are the most popular as they allow for more weight to be loaded onto the Olympic bar. Olympic weight sets are available for sale in 300, 400 and 500lb weight sets and in a variety of styles such as grip plates, rubber coated plates and standard Olympic weights. The grip plates allow for easier movement a lifting of the weight plates. Rubber coated weight sets reduce the risk of damage to flooring and help to keep the weights from chipping. Any of our Olympic weight benches make a great addition to these sets. For storage, check out our selection of plate trees to keep your home gym tidy. Standard weight sets use a smaller diameter bar and generally come in 110 and 160lb weight sets. Always be certain to match up the correct size collar with the bar that you are using. Commercial Fitness Equipment:If you are looking for commercial equipment, take a look at our selection of selectorized weight equipment, commercial weight equipment and commercial cardio exercise equipment. We sell everything you need to outfit your health or fitness club, Crossfit Training center, apartment complex fitness center, school and university weight rooms, personal training studio, hosptial or rehab center, hotel fitness centers and hotel exercise rooms.